Although I’m biased, this is still my favorite wedding photo of all time, taken July 14, 1925. Ruby Viola Treutel and Carl Henry Frank Hanneman joined in marriage at St. James Catholic Church in Vesper, Wisconsin. They were my grandparents. At front left is flower girl Nina Treutel, 11, sister of the bride. At front right is ring-bearer Elaine Treutel, 5, sister of the bride. 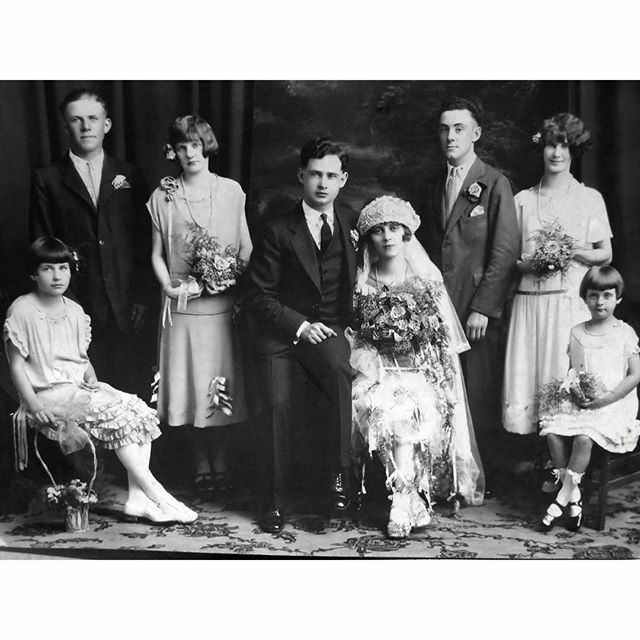 Across the back, left to right, are Joe Ladick (bride’s cousin), Gladys Cole (bride’s cousin), groom Carl Hanneman, bride Ruby V. Hanneman, best man Wendell Miscoll, and maid of honor Esther Allbrecht. Wow! This is a great photo.